I don't know about you guys but I apparently have this thing for holding on to things. When I go gaga for something that tickles my taste buds, I hold on. You know that simply awesome Pho you tasted in this hole-in-the-wall restaurant in Vietnam or that street food you can't get enough of in the wonderful yet labyrinth of a market, Chatuchak in Bangkok? Well, I obsess about these things and make sure I get to taste them over and over again. Some people press rewind in their heads for memories, but me, I press rewind on my taste buds. Food is a part of certain childhood memories right? I'm not going to reach way back into my childhood but you get the picture. My recipes are inspired by this obsession. Wanting to hold on to my favorite flavors in the world for as long as I can and sharing it with friends. I've researched for these recipes, tasted them, went through the trials and the many errors until I get it down to a science. That's why, among many other things, I decided to start this blog. So I could document the soon-to-be pages and pages of recipes that I have made to share with anyone who wants to read it. In this post, I wanted to go back to my honeymoon. 2 years ago, May 2008, we went to Boracay and stayed in the wonderful Discovery Shores. Taking in the sight of this resort was treat enough but to top it off, you know that "Free Welcome Drink" that you think nothing of but is part of the amenities you paid for. Well, this "Free Welcome Drink" was definitely worth thinking of. It was a green shake that looked healthy and tasteless. Oh, how I was wrong! It was like the forest, the ocean and the sun had hugged me when it hit my lips. It was as if Summer and Spring had met and fell in love inside my mouth. It was like taking a shower on a hot summer day. I know what you're thinking, it's such an exaggeration. Yes. But c'mon, give me a break. I couldn't help but take the poetic route here, I was in Shake Heaven! I got the flavors of the shake trapped it in my head, bought the ingredients and drank it again and again. It has to be made fresh all the time cause it has herbs. When blended, the herbs will wilt, it goes from bright green to something that grows on rocks. I thought of infusing the herbs in the simple syrup instead to keep the lovely shade of lemon yellow. I also thought of making it into a sorbet so that I don't have to use the blender all the time to get the taste in my mouth. Here's to memories! Bring the water and sugar to a boil in a small saucepan, drop the mint and basil leaves, remove from the heat, and cool. 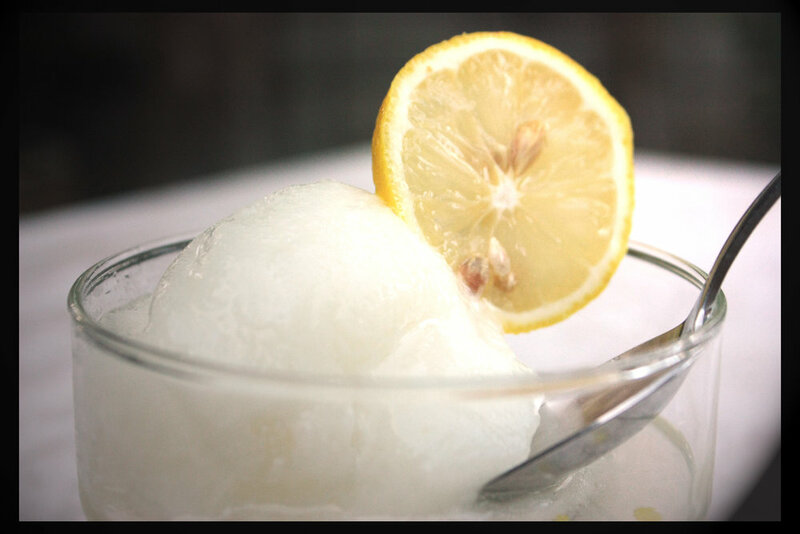 Combine the syrup with the lemon and zest and pour into the bowl of an ice cream machine. Let ice cream machine run until it reaches the consistency of Italian Ice or a daquiri. After the sorbet is made, transfer to an airtight container. Cover tightly and freeze until ready to serve.